A new initiative encouraging people to get active to prevent and fight cancer was launched across the world on World Cancer Day. The 'Support through Sport' campaign aims to reach out to athletes, organisations and sports fans worldwide to raise public awareness about the health benefits of physical activity in relation to cancer. Research published by Macmillan Cancer Support shows that taking part in physical activities not only significantly improves cancer patients' physical and mental health, but also reduces the risk of the disease worsening or recurring. According to the report, a patient with breast cancer can reduce their risk of recurrence by around 40% just by doing the recommended level of physical activity. Launching under the slogan 'We can. 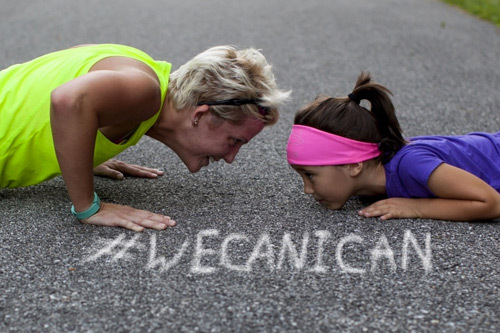 I can', World Cancer Day currently has 555 sports-related events scheduled, which will be documented across social media with the hashtags #WorldCancerDay and #WeCanICan. Dr Cary Adams, chief executive of World Cancer Day organiser the Union for International Cancer Control, said: "This World Cancer Day we want to inspire individuals to play an active role in the fight against cancer, by being physically active. "Around a third of all cancers are preventable through lifestyle changes, such as increasing physical activity and leading a less sedentary lifestyle. A large number of people also find exercise to be of great benefit to their wellbeing either during or after treatment. "The 'We can. I can.' campaign is in its second year and we hope to build on the success of last year and spread the message further than ever." In 2016, the World Cancer Day campaign generated 3.9 billion social media impressions - up from 935 million in 2015 - and mapped over 906 activities in 129 countries worldwide. It also saw 180,000 unique visitors to the campaign website and 98,000 resource downloads ranging from posters and fact sheets to digital guides and infographics. The UICC projects that new cancer cases will rise from the current 14 million to 21.7 million per year by 2030, while cancer-related deaths are forecast to reach 13 million annually.